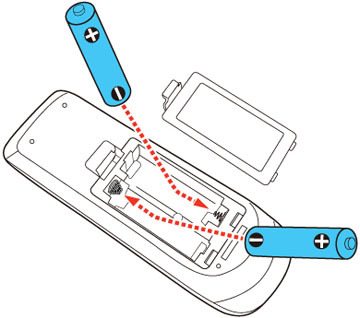 The remote control uses the two AA batteries that came with the projector. Use only the type of batteries specified in this manual. Do not install batteries of different types, or mix new and old batteries. 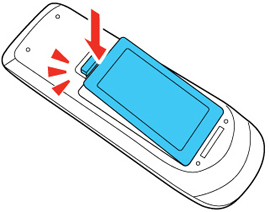 Insert the batteries with the + and – ends facing as shown. 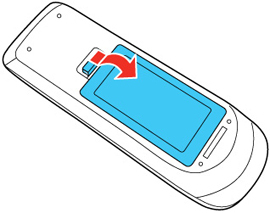 Replace the battery cover and press it down until it clicks into place. Warning: Dispose of used batteries according to local regulations. Do not expose batteries to heat or flame. Keep batteries out of the reach of children; they are choking hazards and are very dangerous if swallowed.